The photo above was taken September 15, 2015. This is my current operating desk configuration. Nice oak double pedestal desk with a solid core door bolted to the top, giving me a lot of real estate for my toys! Behind the two-layer shelf/risers is a multi outlet strip. I’ve got the Elecraft K-Line (K3, P3, KAT500, KPA500), KX3, PX3. Yes, I’ve had a good long sip of the Elecraft Kool-Aid! Am using a Begali Signature paddle (switchable between the K3 and KX3) and a Begali Camelback straight key. 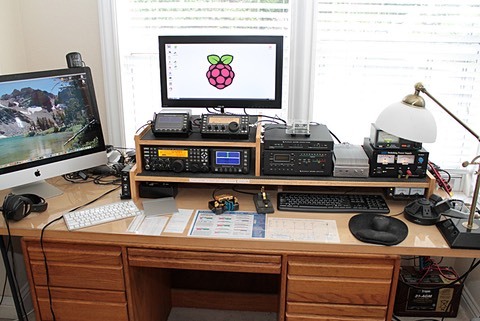 To the right of the KPA500 is a homebrew all-mode 80 watt 144 MHz amplifier, an MFJ-4245MV power supply and atop that sits an MFJ-873 VHF-UHF wattmeter. Down in the bottom left you can see my alternate power supply - a 100 AH AGM battery that is connected through a charge controller to a 72 watt solar panel. The left side of the desk is occupied by a 27” iMac in a dual monitor configuration with the Asus 23” monitor on top. The Asus also is connected to a Raspberry Pi micro computer that I’m experimenting with. Over the years I've had a wide range of equipment. My first station, as a novice, was a Heathkit DX-60B transmitter and a Hammarlund HQ-170A receiver. Kept that combo for quite a few years and then sold the DX-60B, replacing it with a Heathkit SB-401 transmitter. After the move to Florida, I sold both the receiver and transmitter and built a Heathkit SB-102 transceiver. A few years later, I got my first solid state radio - a Kenwood TS-180S. That was replaced by a TS-430S, followed by a TS-850S. When I moved to California, I again changed brands and got an Icom IC-775DSP. Now THAT was a big radio. After a couple more years, I sold the '775 and got an IC-756 Pro III. While still in Florida, I built a Heathkit SB-220 KW linear amp. It was hooked to a Drake MN-2700 tuner. I started messing around with QRP operating back in the mid-90's and went through several low power rigs: Oak Hills Research OHR-400, a homebrew "38-Special", and a Wilderness Radio Sierra. But the ultimate QRP radio I owned was an Elecraft K2/10. Fun to build, easy to operate. Took it on vacation to Hawaii several times, and once to PJ7 - St. Maarten in the Caribbean. And then Elecraft came out with the K3. I lusted after it for a couple years, and finally just had to get one. I sold the K2 and IC-756 Pro III to buy that K3. Best decision I've made! After a year with a pretty much "stock" K3, I added the second receiver and the 144 mHz module. Now, I can use that nifty diversity receive feature. I usually keep the doublet antenna on Ant1 and the 5BTV vertical on Ant2. QSB is almost a thing of the past with this combination and diversity receive with the K3. In 2011 I built the Elecraft KPA500 solid state linear amplifier. Wow, what a nice amp, and it plays so well with the K3. However, I needed a tuner to put between the amp and my ladder line fed doublet. Kept waiting for Elecraft to release their matching auto-tuner. And waited, and waited. Unfortunately, during the almost 12 months since I got the amp, I was having ugly RFI problems when I ran high power. On some bands I'd interfere with our home security system - a 20 years old relic. We have a 63" Samsung plasma TV - I could make the TV turn off or on when operating on 40 meters. On 80 meters, I was able to make the timer on our kitchen stove go off. I had enough - sold that wonderful amp and am now back to 100 watts maximum, RFI free. As I mentioned in my Ham History page, I've got deed restrictions here and technically am not allowed to have ham antennas. Well, tough toenails - I put some up anyway. No giant tower with a monster beam on top, but rather several wire antennas that are partially hidden in the redwood trees. I've got an 88 foot long doublet at 45 feet (40 - 6 meters), an 80 meter inverted L, a 160 meter inverted L, a Hustler 5BTV ground mounted vertical, and a home brew 5/4 wave 2 meter vertical. After two years in this QTH, no one has complained - so far, so good. It's nice to have understanding neighbors! In late 2012 I purchased an AIM-4170C SWR / Antenna analyzer. Had been using an MFJ-259B but there simply was too much manual work involved in mapping out an antenna's performance with a wide frequency range. This analyzer is a very, very cool device and if you can afford one for your shack, I highly recommend getting one. I run mine connected to a MacBook Air laptop running the Mac OS, with VMware Fusion and Win/XP - the AIM software works fine in this configuration. That old high-power bug bit me again. I bought a new Ameritron AL-811 amp, LDG AT-600ProII auto tuner and matching M-600 meter. So, now I can get that great-performing doublet into play with 500 watts out on 160-10 meters. The amp seems pretty nice, doesn't take up a lot of space and is surprisingly quiet. Initially had a loading problem on 80 meters, but a few additional padding capacitors in the tank loading circuit solved that. New parts courtesy of Ameritron - thanks guys. With the new amp in place, I use the 5BTV strictly as a diversity receive antenna, with the doublet on 40-10, and the two Inverted L's on 80 and 160 for primary receive and transmit. Well, not being one to keep things too much the same for very long, I sold off a bunch of stamps that I'd been collecting for a few years. I sold the AL-811 amp and LDG tuner to my buddy Dale K6PJV. Used those funds plus the dollars from the stamp sale and bought another Elecraft KPA500 solid state linear amp. This time I got the matching KAT500 auto tuner to go with it. Very slick combination - the "K-Line" works really, really well together and I do like having this setup. Still use the 88-foot doublet as my main 40-6 meter antenna, along with the 80 and 160 meter Inverted L's, with the Hustler 5BTV as the diversity receive antenna on 40-10. I had sold my K2 a couple years ago, along with the Icom 756 ProIII in order to get that way cool K3. But I realized over the past year or so that I missed having a small QRP rig to take on vacations and camping trips. That Elecraft KX3 looked like a fine QRP rig. After a couple months of being on the receiving end of some serious hint-dropping, the XYL surprised me with a KX3 on Christmas, 2013. Assembly was a piece of cake. I've since added the internal antenna tuner and the KXBC3 Battery Charger / Real Time Clock. It could easily be one's sole base station radio - it's that good. But I'll keep my K-Line too, thank you very much! FINALLY GOT my Five Band Worked All States (8BWAS)!!!!! It really sucked having to start over after moving from Martinez to Folsom, but with some persistence and experimentation with new modes (JT65 & JT9) I got 5BWAS #3,187 in April. If you are interested in what I did to make it happen in a relatively short time, drop me an email and I can elaborate. However, 5BWAS was just the start. I am now on a quest to get WAS on 160, 30, 17, and 12 meters. To that end, I added two new antennas. First, I built a Moxon Beam for 12 meters. Was a fun project and I'm very happy with the result. Since I have HOA/CC&R crap to deal with, I can't get the beam very high. I've got it up about 20 feet or so (1/4 wavelength) on a fiberglass push-up mast. First QSO with the Moxon: 3D2RH in Fiji!. In order to have a more efficient 30 meter antenna, I temporarily took down my Hustler 5BTV and replaced it with a homebrew 30 meter vertical made with five tapering sections of aluminum tubing. It uses the tilt base the 5BTV was mounted on, and also employs that 40-wire radial field. First QSO with this vertical was with HS0ZEE in Thailand!